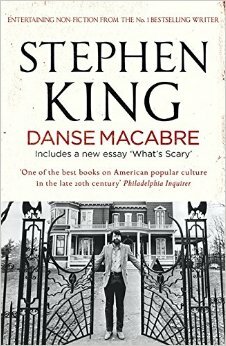 Danse Macabre is Stephen King’s non-fiction book about the ‘entire horror phenomenon’ as he sees it. In the book King lists the films, TV shows and books that he considers to be of particular importance to the genre. He restricts himself though, to the 30 years between 1950 – 1980. Even with that restriction on content Danse Macabre runs to nearly 480 pages in length, so you can imagine what a mammoth task such an undertaking would have been for him had he not restricted himself. When it comes to choosing a book to read every reader has his or her own preference in reading matter. Personally, if I intend to read a book from cover to cover, I choose fiction every time and only delve into works of non-fiction as a means of research. It is my intention to read every one of King’s books though, and I thoroughly enjoyed his other non-fiction book On Writing. Come what may, I decided I would read Danse Macabre as well and I began to do so a couple of years ago, but put the book aside because I found it hard going and not nearly as easy to get into as On Writing. But King makes a lot of interesting points in Danse Macabre and I believed that I could learn a lot by reading it. So I tried again and this time I read it alongside some other books and limited myself to reading just a few pages of it a day. It is an interesting book and I am very glad that I have finally read it all the way through. Danse Macabre helped me to take a look at some of my old favourites (movies and books) and see them from a slightly different perspective. Danse Macabre is an invaluable read for true fans of the horror genre and whether a reader chooses to read the book in dribs and drabs, like I did, or just go ahead and gobble it up whole, it is a very worthwhile addition to the library of any horror fan. A little of Kings biography is also thrown into the eclectic mix that is Danse Macabre and I enjoyed reading about some of the personal memories that he connects with particular books or films. There are also a couple of very useful appendices at the end of the book. Appendix one contains a list of around 100 movies that King considers to be particularly interesting and his personal favourites are marked with an asterisk. Appendix two does a similar thing with books.